Perennials are the plants that come back every year. Unless they don’t. This (in)famous explanation of perennial versus annual plants is one that I stumbled across about ten years ago, when I was gung-ho for gardening. It’s accurate: several perennials I carefully placed in the ground at fall planting time have showed nary a slender stem of themselves aboveground the following spring. Maybe the groundhogs ate the bulbs, maybe there was too much rain and the roots rotted in the damp soil. A more-experienced, faithful gardener could probably posit a few other reasons and make an educated guess about which was the most likely culprit. But I’ve discovered that focusing on writing is not compatible with gung-ho gardening: each demands attention to detail at a level that precludes the other. So the rhubarb flowered before I harvested it, and the black-eyed Susans are running amok over the thinly-mulched paths, and the foxglove is begging to be divided. My only gardening indulgence thus far was on Mother’s Day, when I requested a gift of labor from my sons and Engineer Hubby. We cleared a grassy bed and put in tomatoes, basil, and tomatillos. That’s gonna be it for the year. I swear. I will not procrastinate by weeding. I will not avoid the blank page by deadheading any flowers. I will not wander in the garden humming a song of despair about my lack of productivity. Yeah, I don’t believe me either. Purple petunias, in need of deadheading. Besides, as Dr. Noa Kageyama notes in his blog post “Pride Yourself on Your Work Ethic? Why You Might be More of a Slacker than You Think,” forcing ourselves to sit down and “practice” when we really really really wanna take a nap or a walk or drink a cappuccino may be counterproductive — we’re not working efficiently or effectively when we’re tired, or dispirited, or hungry. That said, today I really really really didn’t wanna sit down and write. 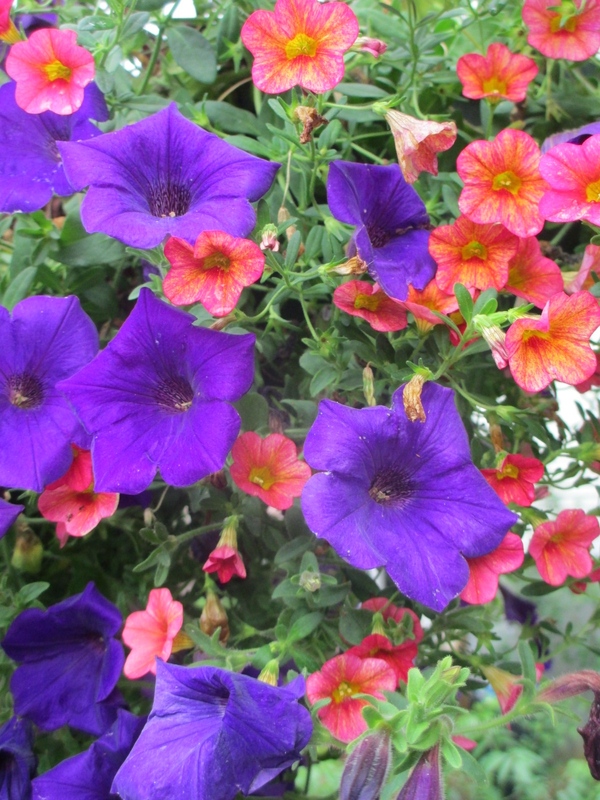 I wanted to, well, weed the garden and deadhead the purple petunias. Discerning whether or not my resistance is grounded in a real need for rest, or not, is the tricky part. The most effective tool for discernment, for me, is writing. The type of writing I intend to burn before I die. Whiney, self-indulgent, wallow-in-my-first-world-problems writing. But here’s the thing. It works. When I put my whiney self into words, on paper, then they become just words. Words that I can re-read after the second cup of tea, words that I can then consider and compare to my now-cleared heart and head. Today, I smiled at my words of angst — they were eerily similar to my angst as a younger woman, when I was parenting younger children, when 45 minutes to write was the highlight of the week. I hadn’t noticed, before I whined into my journal, that although I still feel I don’t have *quite* enough hours in the day, I have many, many more hours than I once did — and that I am doing much, much more writing than I did then. That the sense of “not enough” was based in my own choices to add (writing) work to my plate. How fascinating that I nonetheless was telling myself I didn’t have enough. Is that inherent to me as a human being: whatever we get we want more? Or is that unique to just me, the individual? Or a subset of humans, all of us sharing a delusion about time, energy and capacity? I decided I don’t need to answer those particular questions today. Today, it is enough to notice that the stories I’m telling myself are perennials – they come back year after year. And to know that today, I can plant a different story. A big bushy annual that will shade out the perennial. Or I could dig up that tiresome perennial and relegate it to the compost bin. Ah, the joy and power of words and overused metaphors. Onward to the blank page! This entry was posted in Essays and tagged annual plants, creative practice, Noa Kageyama, perennial plants, story, writing. Bookmark the permalink.